Like most Southeast Asian girls, I have been blessed with panda undereye circles that always get worse with less sleep. As a mom of TWO kids under the age of 5, it is safe to say that I never get enough sleep. So the panda eyes are in effect on a regular basis. And no, I don’t look as cute as panda does with them. When people say “wow you look tired!” we all know that they mean you look like crap. And no one intentionally wants to look bad. So I have come to rely on makeup to get me looking like a human again. Perhaps one day I can venture out bare faced (when the kids finally sleep the night…which is looking like it could be when they reach college). In the meantime, I will try my best to fake looking rested with makeup. While we may have gotten the concept of contour (creating a chiseled look with dark matte powder) and strobing (using luminescent creams or powders to highlight) down, there is yet a new makeup trend to try. 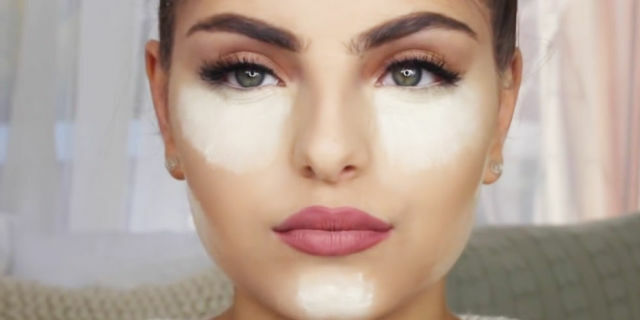 It is called “baking” and unlike contouring (which looks crazy and is hard to do for me), this makeup trend works. Baking your makeup is when you use layers of powder set by the warmth of your skin to create a creaseless, flawless finish to your skin. This may sound counterintuitive, but your skin should always be clean and moisturized before you bake your makeup. I really recommend Neutrogena Hydroboost Cream. It just drenches your skin in moisture. I use a primer because I am too busy to reapply my makeup (ha who has the time?). I use a pea sized amount. I use the Smashbox Primer, but a drugstore dupe is the NYX Primer. I don’t actually wear foundation. If you do wear foundation, put that on and then add concealer. I basically just put a thin layer of concealer that has been thinned out with argan oil to create a diffused lovely coverage of my panda eyes. I use Maybelline Master Concealer. Go back and add another layer. This is when I add a layer of Kevyn Aucoin Sensuous Skin Enhancer (which is like spackle). Make sure to pat this layer on so it doesn’t smudge the previous layers! THIS is where the magic happens. PACK on a lot of translucent powder on the concealer. I use MAC Prep and Prime Finishing Powder. Take a damp sponge and dip it back in the translucent powder. Dab it over the powdered area. Let it sit for at least 3 minutes. I typically leave it on while I do my eye makeup. Dust off the excess powder with a brush and voila! You should have rested, creaseless looking eyes! Do any of you bake your makeup? What are your tips for this technique? Let me know in the comments below.